Former pit communities which have been “left behind” since the closure of the mines still need support to recover from the industry’s demise. That was the message from The Coalfields Regeneration Trust (CRT) when the organisation addressed MPs in Westminster on Tuesday. The trust said more action was needed to boost employment, skills and health within former mining towns and villages, including those in the Wakefield district. 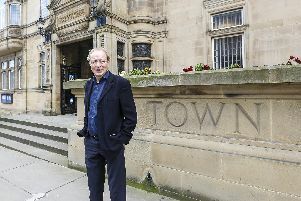 Andy Lock, head of operations said 42 per cent of neighbourhoods in Yorkshire fall into the 30 per cent most deprived in the country. Pontefract, Castleford and Normanton MP Yvette Cooper is one of 40 MPs who have signed a pledge to support the work of the trust. Wakefield MP Mary Creagh has also signed the pledge. Ms Cooper said: “The early work the CRT did was really important for our area - including training and skills for former miners, supporting jobs and regeneration on pit sites like Glasshoughton and investing in community facilities like Ferrybridge Community Centre. “But in recent years the government has slashed their funding even though coalfield communities still need investment and round here we are still dealing with the closure of Kellingley and the loss of skilled jobs. The CRT used this week’s Westminster reception to outline plans for a Coalfield Investment Fund. It said cash would be used to support small and medium enterprise growth, bringing around 1,000 jobs to the coalfields over the next five years. These developments, it said, would then produce £50m over a 25 year period, to be used to support community projects.